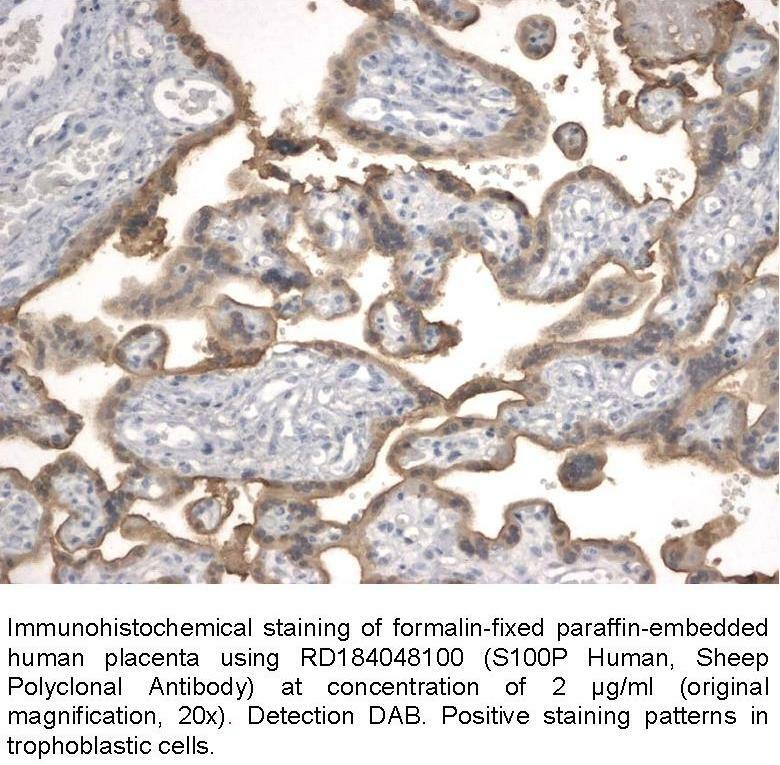 The antibody was raised in sheep by immunization with the recombinant Human S100P. Immunoaffinity chromatography on a column with immobilized recombinant Human S100P. S100P was originally described as a placental protein of 95 amino acid residues shares about 50% sequence identity with the brain S100 proteins alpha and beta. S100 proteins are small dimeric members of the EF-hand superfamily of Ca(2+) binding proteins thought to participate in mediating intracellular Ca(2+) signals by binding to and thereby regulating target proteins in a Ca(2+)-dependent manner. S100P is dysregulated in the androgen-independent prostate cancer cell lines LNCaP-R, DU145, and PC3 and may play a role in the etiology of prostate cancer. In ductal hyperplasias, in situ and invasive ductal carcinoma, but not in the normal tissues, S100P overexpression is an early event that might play an important role in the imortalization of human breast epithelial cells in vitro and tumor progression in vivo. In NIH3T3 cells, the expression of S100P led to the presence of S100P in the culture medium, increased cellular proliferation, and enhanced survival following detachment from the culture substrate or after exposure to the chemotherapeutic agent 5-flurouracil. The proliferation and survival effects of S100P expression were duplicated in a time- and concentration-dependent manner by extracellular addition of purified S100P to wild-type NIH3T3 cells and correlated with the activation of Erks and NF- B. To determine the mechanisms involved in these effects, we tested the hypothesis that S100P activated RAGE (Receptor for Activated Glycation End-Products). It was found that S100P co-immunoprecipitated with RAGE. Furthermore, the effects of S100P on cell signaling, proliferation and survival were blocked by agents that interfere with RAGE including administration of an amphoterin derived peptide known to antagonize RAGE activation, anti-RAGE antibodies and by expression of a dominant negative RAGE. These data suggest that S100P can act in an autocrine manner via RAGE to stimulate cell proliferation and survival.